The premier is currently attending the World Economic Forum’s Annual Meeting of the New Champions, also known as the Summer Davos. Li promised more reforms despite stressing that China will continue on its path of interest rate marketisation after it frees up controls on bank lending rates. “China will have to rely on reforms to achieve long-term, sustainable and healthy development of its economy,” he said on Tuesday. The government should let the market carry its roles in order to induce more vitality, said Li. China’s second stage of economic revolution comes amid the new leadership stating it is willing to accept slower growth in order to address long-term structural priorities. “We would rather bring down the growth rate to a certain extent in order to solve the fundamental problems hindering our economic development in the long run. In this sense, such a growth rate is the result of sound adjustment,” said China’s President Xi Jinping. In a bid to reduce red tape, China’s central government has reformed its administrative approval system this year, scrapping or relegating more than 200 approval rights, which were previously held by the government. “Our purpose of reforms is to let more people enjoy the fruits they will bring,” Li said. In a further push to renminbi internationalisation, China will promote the convertibility of the yuan under capital account, introducing “more options” other than the current offshore yuan businesses, he said. 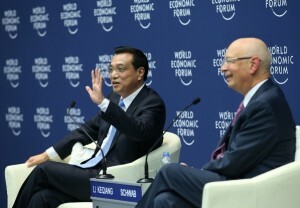 The premier said that Switzerland also expressed desire to develop offshore renminbi business during his visit in May. “I will seriously consider the suggestion. Of course, this should be carried out step by step,” said Li. China will also diversify its capital market, widen financing channels to allow more direct financing and further open up its financial sector through measures such as piloting township bank trials, said the premier. Li has said China will continue to create a favourable environment for foreign investors. “Foreign firms are always welcome to invest in China,” he said. Meanwhile, China has announced a key meeting of the ruling Communist Party of China (CPC) to discuss reforms and further opening up of the Chinese economy in November. The Summer Davos will be attended by global economic stakeholders from September 11-13 in Dalian, a port city in northeast China’s Liaoning Province.